Below is a more in depth look at emailing talent from a booking, with detailed explanations on what goes where. If you would like the talent Schedule to be included in the email, make sure the 'Email' box is ticked after each Schedule type. The box is ticked by default, so if you do NOT wish for a Schedule to appear in the email to talent simply untick the box. 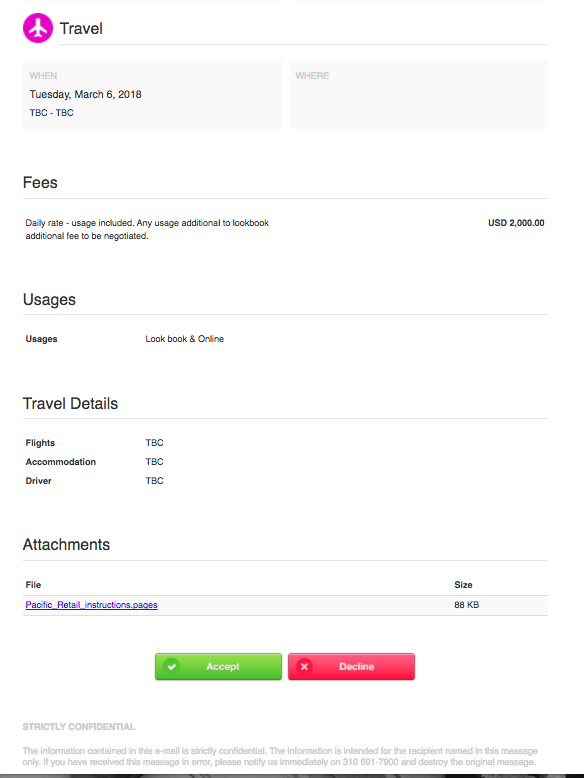 If the fees & details box has been filled out, then the fees will show up in the email to talent. The Expenses box does not show up in the talent email by default. If you would like to add it into the talent email, please let us know. If the notes box has been filled out, it will appear right at the top of the email to talent. This is where you would put any Notes pertaining to the booking that you would like the talent to know about. If you have loaded attachments into the booking, then you are able to select here which ones (if any) you would like to send out to talent. 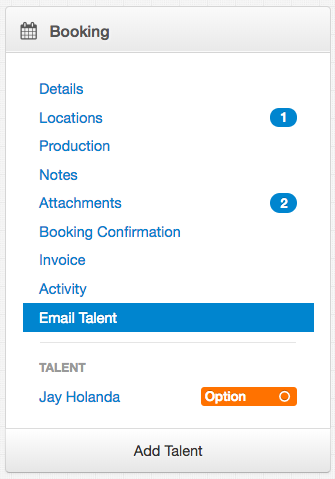 Once you are ready to email the talent from the Booking, click on the Email Talent tab. You are able to preview the email you are sending to the talent by clicking on the Preview button to the right of the talent name & email address. 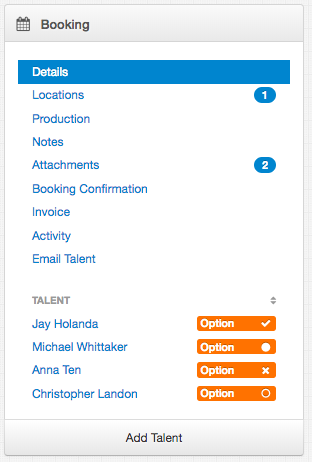 The "Show confirmation button" box is ticked by default - this enables the talent to accept or decline when you send them their schedule via the booking email. 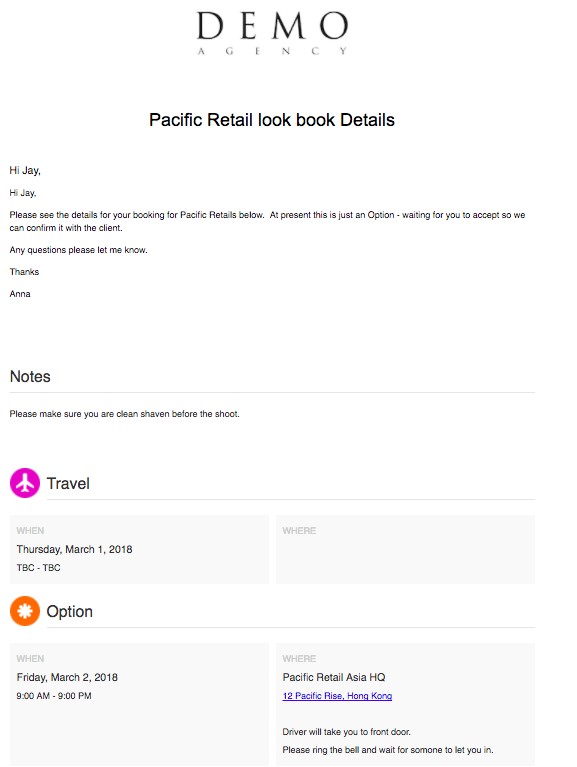 Usage and Travel details are taken from the main details page- these will not appear in the email if they are not filled out. 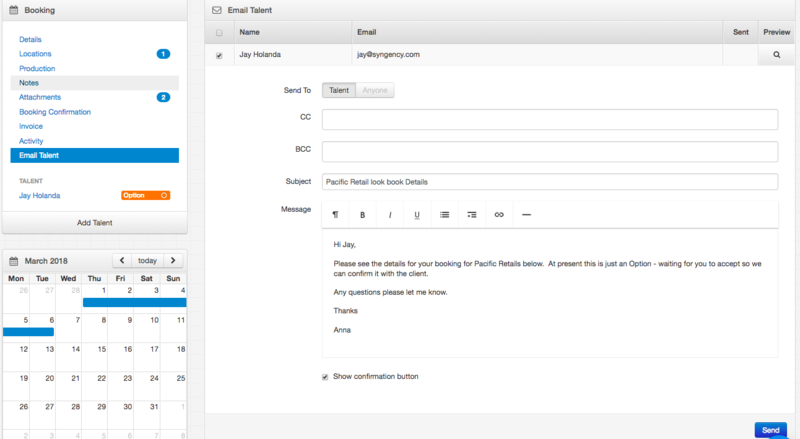 Once you have pressed Send a green tick will appear next to the talent name to show that the email has been sent. Once you have emailed all the talent you can track whether they have been emailed or not and accepted or declined by the icon next to their names on the main page. Solid circle means "sent, waiting on response". Empty circle means "email has not been sent". 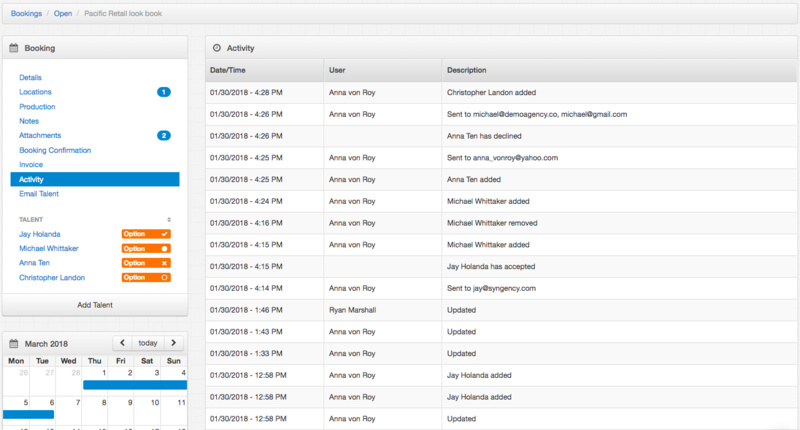 You are also able to view the talent status by clicking on their name in the booking and viewing their Schedule. You are able to manually edit the talent Status from here if necessary, by clicking on the icon and selecting a new Status.